… just for a moment, to God’s awesomeness :-). Remember that old cliche you’d encounter all the time in shows and cartoons when you were a kid? The whole “I could beat you with both arms tied behind my back! !” thing? Well… as St Augustine and St Catherine of Siena both remind us, that’s precisely what Jesus Christ did. He had both arms pinned down… nailed… to a plank of wood so that He couldn’t move them. And even as He bled out – literally Love poured out – He defeated evil. He overcame the world. Categories: Cross, evil, Jesus Christ | Tags: battle is won, John 16:33, love poured out | Permalink. I discovered something very ugly in myself today, as I reflected upon an event in my past. As a novice, I was writing a paper that involved some exegetical work with the Psalms. During my private prayer and study, I encountered a fairly involved connection between one of the Psalms and the Gospel of Matthew that excited me greatly! I added it to my paper as part of the case I was trying to build to support the central thesis of the paper and thought little more of it until the following day. At the evening meal the following day, I was sitting at table with my sisters in the refectory, and listening to the spiritual reading selection of the evening as is monastic custom. Jesus of Nazareth: The Infancy Narratives by Pope Emeritus Benedict XVI was hot off the presses and we were hearing it for the first time the very week it was released. That evening at table, I heard THE VERY SAME EXEGESIS that I had prepared on the day prior, read from the work of the then Holy Father. Exegetical method AND conclusion were almost identical. And here it was, published by the Holy Father! But when I had typed it the day prior, that very same argument had been my own original work. Supposedly original. So here is where my ugliness crept in. I started getting all upset about INTELLECTUAL PROPERTY of all things. Can you think of anything more ridiculous than wanting to compete with the Pope over the intellectual property? An account of my folly: I went to see my superior first thing the following morning. I wanted to know what to do from an academic honesty perspective. I didn’t want to cite the Holy Father. I felt I was justified in claiming the work as my own, given that I HAD arrived at the conclusions before encountering them elsewhere, even though they had existed elsewhere prior to my discovery of them. I wanted to use the electronic timestamp on the document in which I had written my paper to demonstrate that my conclusion was written prior to the night that it had been read to us at table. PRIDE. How it corrupts the beauty that God created in me. I write of it now because I refuse to let shame take a hold. Shame is a lie. Of COURSE I’m weak – why be scandalised by that? Here is an opportunity. Out of the depths I can call upon the Lord. Out of my weakness, I can still witness to the Truth. I call upon ALL who read, study and pray with Scripture to recall that ANY time we are able to draw something from the Sacred Text, it is RECEIVED. It is a GIFT. It is the Word, GIVEN to us. The conclusion I reached when working with the Psalms and the Gospel of Matthew? It wasn’t mine. It was given to me, by the very same God who gave it to the Holy Father. Instead of resenting that he got there first, what on EARTH am I doing not giving thanks that such a thing was revealed to me, a mere child? (And a spoiled child at that!!) I give thanks now, and offer my very failure to do so earlier to the Lord that He may bring good out of it. Curious to know what the exegetical conclusion was? Go read Jesus of Nazareth: The Infancy Narratives by Benedict XVI. In the meantime, I pray for humility, and I return to my study of the Scriptures… on my knees. Categories: conversion, Gospel of Matthew, gratitude, humility, Pope Benedict XVI, pride, Psalms, Scripture, spiritual reading | Tags: academic honesty, academic hubris, honesty, intellectual hubris, intellectual property, Jesus of Nazareth, Pope Benedict XVI, Pope Emeritus Benedict XVI, pride, Scripture study | Permalink. In churches around the world today, the Tabernacles are empty. The Lord Jesus, who makes Himself truly present to us in the form of bread and wine and dwells Sacramentally among us in our churches, cannot be found where He usually resides. 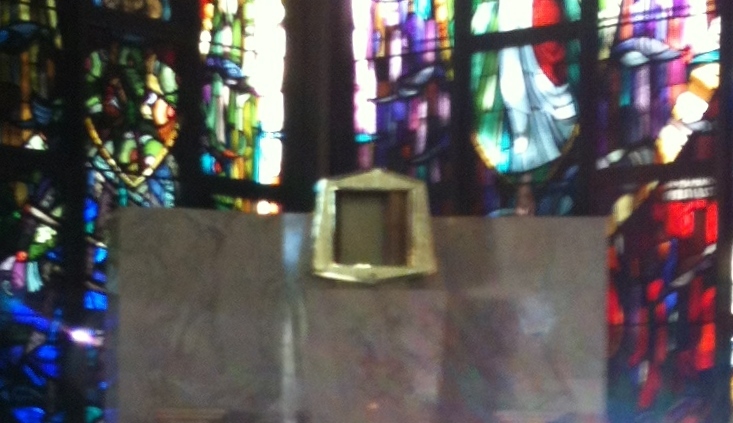 The empty tabernacle calls to mind the Lord’s lifeless Body in the tomb. Jesus, who is God, truly died on that First Century Passover. What transpired between His Death and Resurrection? We profess in the Apostles Creed to believe that He descended into Hell, and on the third day rose from the dead. For your sake I, your God, became your son; I the Lord, took the form of a slave; I whose home is above the heavens, descended to the earth and beneath the earth. For your sake, for the sake of man, I became like a man without help, free among the dead. For the sake of you, who left a garden, I was betrayed to the Jews in a garden, and I was crucified in a garden. Rise, let us leave this place. The enemy led you out of the earthly paradise. I will not restore you to that paradise, but I will enthrone you in heaven. I forbade you the tree that was only a symbol o life, but see, I who am life itself am now one with you. I appointed cherubim to guard you as slaves are guarded, but now I make them worship you as God. The throne formed by the cherubim awaits you, its bearers swift and eager. The bridal chamber is adorned, the banquet is ready, the eternal dwelling places are prepared, the treasure houses of all good things lie open. The kingdom of heaven has been prepared for you from all eternity. Categories: Cross, evil, fear, freedom, grace, Heaven, Hell, Holy Week, Jesus Christ, love, sacrifice, silence | Tags: ancient homily for holy saturday, Awake O sleeper and rise from the dead, battle is won, consequences of The Fall, Cross, Crucifixion, empty Tabernacle, encounter with Christ, Garden, He descended into Hell, i your God became your son, lifeless body in the tomb, love, my side has healed the pain in yours, pondering God's works, receiving mercy | Permalink. Crucifix laid out for Good Friday veneration. Likewise, discouragement is a device of the evil one and must be seen for the deception it is. Shame is our instinctive response to an internal acknowledgement of inadequacy or wrongdoing. Discouragement is a response to an awareness of shame. A spiral of lies. Before Jesus shouldered our sin upon Himself and died to reconcile the world to Himself, the cross was the instrument of the most shameful death in society. Crucifixion was the execution of choice for criminals and agitators; there was nothing dignified nor heroic about it. Setting humanity straight in more ways than one, Jesus subverts everything we think we know about the world. The Cross had no power over the Creator of its makers, nor the nails over the Lord of the man who hammered them into place. A friend of mine wrote a wonderful song, a reflection on this very point. Her song was called “Not by Nails” and it speaks of the Love which held Our Saviour to the Cross. God is love, and Jesus is God. Jesus was physically nailed to the Cross but it was Jesus’ own choice to be bound by that physical reality. Love and obedience carried the day. Jesus did the Will of His Father out of such a pure, personal, particular and preferential love for you, for me, for each individual that ever has or ever will live that we can’t even begin to fathom it. As a child, I understood on some level my complicity in Christ’s death, but rather than solemnly contemplate in silent gratitude the gift of our salvation and the means by which it was wrought, I used to get very upset about the brutal way in which Jesus was executed. It took some time before I started to learn that love was more than a feeling. Love is a choice. Love is the choice symbolized by the Cross. Before Jesus died for us, shame was the only appropriate response to sinfulness and inadequacy. In dying, Christ won for us the freedom to choose between continuing to dwell in that shame, or a radically different response: love… and the trust and the gratitude that go along with it. I no longer look to myself and my weakness. Yes – my weakness is there… but I’m not scandalized, I’m not ashamed. No… I no longer look to myself. I have Christ ahead of me and I choose to look to Him, to He who is Love. Categories: Cross, emotions, evil, freedom, gratitude, Jesus Christ, love, Pope John Paul II, sacrifice, shame | Tags: Cross, Crucifixion, disfigured Face of Christ, experiences of God's love, freedom, gratitude, i no longer look to myself, love, love is a choice, not by nails, Pope John Paul II, receiving mercy, shame, shame is a lie, transfigured Face of Christ, Vita Consecrata | Permalink. The events of Holy Week present us with one of the most universal weaknesses to result from The Fall – the tendency to point the finger. within their scope of being, attempted deicide. parents attempted to hide from Him. the standpoint of maintaining control of the people under his governance. by Christ is present and only differs in its degree. conspiracy by giving over to Judas the promised 30 pieces of silver. attempts to return the earnings for his treacherous deed to chief priests. which an execution had been purchased, refused to take the money back. In this case, the 30 pieces of silver are symbolic of responsibility. execution back onto the Jews. I too, am culpable of deicide. If evil, by definition, is the privation of a due good, then it stands to reason that to choose evil is to choose for the absence of God who is the embodiment of ALL good. I too attempt to hide from my wrongdoing and through each little self-lie I try to convince myself that I haven’t done anything wrong. I too look to blame my wrongdoing on others, or on circumstances, or on anything I can think of to shift the blame from myself. In my fallen state, I sever my tie with God, I alienate myself from Him through sin. The best act of love that I can think of to offer my God in reparation for my sinfulness is to solemnly examine my conscience, admit my guilt and, realizing that I cannot undo the damage that I have done, turn back to Him in the Sacrament of Reconciliation, the gift by which the fruits of His Sacrifice, that is, reconciliation with the Father and a healed and renewed relationship with Him, is made legitimately mine. No longer do I feel the need to reach out and take for myself a forbidden fruit. The Lord Himself, who makes all things new, is OFFERING legitimate fruit to me, fruit that is wholesome and good. All I need do is have the honesty and humility to receive it. Categories: evil, fear, freedom, Holy Week, Lent, mercy, pride, responsibility, Sacraments | Tags: blame, consequences of The Fall, deicide, Garden, hide, Holy Week, honesty, Judas, Passion & Death of Our Lord, personal responsibility, Pilate, pointing the finger, receiving mercy | Permalink. I was reading a blog that I follow (and generally enjoy) and the blogger was speaking about trolling, and how anytime a particular angle was used with respect to the topic in which he was interested, it must surely be a troll post. As someone who, once upon a time when I had much less life experience, held the very position to which he objected, I know that the expression of this (however misguided I now know it to have been) was never intended as trolling. Perhaps it LOOKED that way, but it was not. Always give others the benefit of the doubt in assuming good intentions… if not good judgement! It is so easy to get worked up on an interior level about a fabricated imitation of reality that reflects to us our fears in a situation far more than it reflects the objective reality. Psychologists such as Reeder have done studies that show how the tendency to do this arises with bias because of opposing views… His research is interesting and HE is an expert whereas I am not, but I’d hazard the suggestion that fear is truly what causes this behaviour. Fear would be the substance to which the opposing view was an accident, or at least, a trigger. If you look at the Spiritual Exercises of St. Ignatius, you will see in annotation 22 an exhortation to extend the benefit of the doubt to others as a benchmark of basic civility. That this is included in this work, however, demonstrates that it is about more than playing nice with others… It is a crucial part of spiritual theology and has a direct bearing on our interior peace and the quality of our relationship with God. Imagine a tightly wound ball made from rubber bands… when we get caught up in others’ motives and what they might think of us, something inside of us gets wound up just like that ball… But instead of rubber bands, it’s a complicated entanglement of pride and fear. This image is another piece of wisdom I owe to my old Novice Mistress. Truth needs to enter in. Really, if we allow ourselves to get worked up about imagined motives on the part of another, well, we’re fooling ourselves. We allow our reasoning to become compromised by the fallacy “ad hominem” and as such allow our view of the other to become poisoned. This is how relationships degenerate toward discord. Surely if we are going to hold an unfavorable opinion of someone we want it to be informed by truth, by what can be apprehended from objective reality, as opposed to emotional supposition, self-lie and the tangled mess of pride and fear? If there is not enough fact to go upon then integrity is required to be able to admit to ourselves that we just don’t know why that person did or said what she did. And from there? Trust. We need to trust in the good intentions of others until their intentions are proven to be otherwise. The jaded person who employs cynicism about others as a defense mechanism doesn’t protect himself from deceit. Perhaps he won’t be fooled by others. But he’ll be fooled by himself and he’ll have cheated himself of happiness. 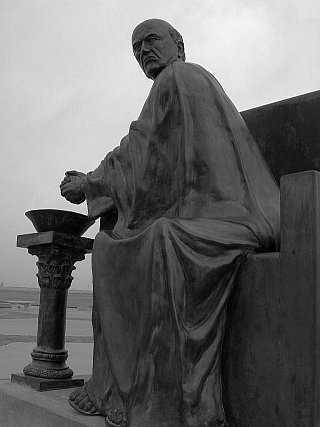 Categories: fear, happiness, inner peace, pride, reality, relationship, St. Ignatius of Loyola, truth | Tags: ad hominem, attributing motives, benefit of the doubt, interior peace, motives, Spiritual Exercises of St Ignatius | Permalink. put on righteousness as a breastplate, and a helmet of salvation upon his head; he put on garments of vengeance for clothing, and wrapped himself in fury as a mantle. And he will come to Zion as Redeemer, to those in Jacob who turn from their transgression, says the Lord. And as for me, my covenant with them , says the Lord: my spirit which is upon you, and my words which I have put in your mouth, shall not depart out of your mouth, or out of the mouth of your children, or out of the mouth of your children’s children, says the Lord, from this time forth and for evermore. Isaiah illustrates the victory of the Lord over the darkness he describes in verses 9 and 10 when he describes the Lord’s coming as the rising of the sun (Is 59:19) and it is this total victory that makes the covenant described above possible. Paul challenges the people of Ephesus to put on the armor worn by the Lord in Is 59. Paul frames his text within a battle against principalities, powers, the world rulers of this present darkness (referencing Is 59:9). He asks each Christian to equip himself for battle and to fight with these tools in order to withstand the wiles of the devil, and to quench his evil darts. He shows his reader that this is the way for him to begin living the covenant that Isaiah records the Lord making in chapter 59, where the Spirit is upon him and that the words of the Lord are being given him. Verse 11 is enough to give me chills, and here’s why. 11 Put on the πανοπλιαν of God, that you may be able to stand against the μεθοδειας of the devil. The two words of interest are πανοπλιαν (transliteration: panoplian) which literally means “whole armor” and εθοδειας (transliteration: methodeias) which means wiles/tricks. So far, so good… so what? At this point its all about the word selection Paul has made, and the word he chose NOT to use. In biblical Greek, there are two words for wiles/tricks. One of the words is the one that Paul chose to use in this text, i.e. methodeias. The other word with the same basic meaning is πανουργια (panourgia.) Notice the inclusion of the prefix pan in the word that Paul chose not to use. Why is this important? Paul is trying to illustrate that the battle is uneven… no, that its already won! God provides whole armor, complete protection. The devil doesn’t have a complete arsenal of tricks to throw at us, the kind of tricks that would match up to whole armor. This is highly encouraging! Put on, then, the whole armor of God. Christ came, the Dawn of Compassion that broke among us, the Rising Sun that vanquished the rulers of this present darkness. He came, He fought and He won. We who follow Him are still playing our part, we are still fighting in the name of His victory as the saga of time and space plays out to its conclusion. If we fulfil our part of the covenant of the Lord by wearing His armor, quenching the darts of the evil one, praying at all times in the Spirit, keeping alert, persevering and making supplication for each other… so too will the Lord keep His promise to us – the Spirit will be upon us and His Word will always be with us. We will abide in Him and He will abide in us, participating in the Trinitarian Life that is the birthright of those adopted sons of God who were born to new life in baptism. Categories: Ephesians, evil, faith, Isaiah, Koine Greek, perseverance, Scripture, truth, virtue | Tags: armor, battle is won, Biblical Greek, eph 6 11-19 greek, ephesians 6 11-19, helmet of salvation, Isaiah 59, pray at all times in the Spirit, put on the whole armor of God, righteousness as a breastplate, rulers of this present darkness, sword of the Spirit, vengeance for clothing, wiles of the devil | Permalink.